Despite the availability of a large potential workforce, finding, developing and retaining the right talent can be time consuming, frustrating, and sometimes an exercise in futility. Organizations that combine technology with enhanced employee value propositions are finding some answers to these challenges. Three things can help overcome these very real obstacles: a clear value proposition, empowered employees, and a forecast of future needs. 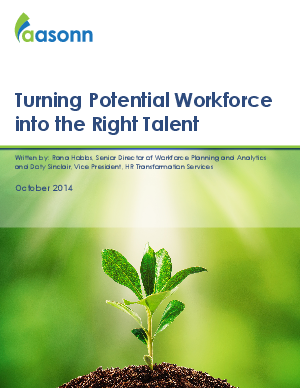 Download our new White Paper on Turning Potential Workforce into the Right Talent Strategy to learn how you can conquer these hurdles and help your business thrive.